On Monday, October 22, a crowd of a hundred or more advocates representing dozens of local community groups gathered at City Hall in San Francisco with a common (though singular) goal: to close the San Francisco Jail. Those same demonstrators were back again on Wednesday, October 24th to speak at a public hearing and make their case. After a successful campaign to prevent a new jail from opening several years back, the No New SF Jail Coalition is advancing its plan to decarcerate the city and move away from policing and toward healing and community support. The current jail at 850 Bryant St. is a danger to those incarcerated as it is not earthquake safe, has major plumbing and sanitation issues and there is no plan in place to evacuate prisoners in case of an emergency. There is already funding set aside currently to relocate inmates in 2021, and the campaign argues that money should be redirected into housing for formerly incarcerated people and their families in order to decrease the jail population immediately. Furthermore, the criminal justice system disproportionately targets people of color and homeless people, pushing those who are already marginalized into cells and deeper into poverty. People of color are targeted more by police, over charged, more likely to be convicted and given harsher sentences. Black people make up only 6 percent of the city’s population, and yet they make up 56 percent of the jail population. And homeless folks face criminal charges for the very life-sustaining activities we all must do to survive: sitting, sleeping, eating, urinating. Unhoused people represent 30 percent of those currently in jail, which means that we are spending resources that could be going into housing to end homelessness to further criminalize poor people. Transitional Age Youth make up 25 percent of the jail population. It is essential that as a community we realize that criminalizing of these youth will cost us far more than investing in the resources and support they need to become healthy productive members of our community. Youth need interventions that are developmentally appropriate and support them to heal from trauma, not criminalization and incarceration that not only inflicts further trauma and harm, but thwarts their neurological development during a critical phase of their lives, diminishing their possibilities to thrive in the future. The Coalition of advocates who came to the hearing offered their own ideas for how to redirect resources away from the jail and into community programs. 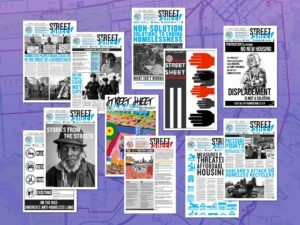 They identified housing as a prime need for those impacted by incarceration and advocated the creation of cooperative housing and services located in neighborhoods targeted by police. Also important is that mental health services be expanded through community based voluntary and user-led care rather than through policing, locked wards, courts, probation, or the jails, as many impacted folks are suffering from mental health issues. And rather than relying on the racist criminal justice system, we could be investing in a Transformative Justice Conflict Mediation Center, with models of accountability that do not rely on jailing as punishment. Outside of City Hall that Monday afternoon, advocates raised a banner held by balloons up to London Breed’s office window, while demonstrators shouted out things they would rather see than criminalization and policing. “Accountability!” “An end to racism!” “Housing!” “Transformative justice!” “Queer liberation!” The banner, reading “No New Cops! No New Jails!” floated in the wind outside City Hall, bearing a message of hope.